Oh fudge! September's here, school's back in session. We have our precious Labor Day, and then back to business. Bummer. So as I muttered "Fudge, fudge, fudge" over and over again about the too-soon demise of summer, I started thinking to myself, "fudge. Fudge? Fudge!" After all, nothing takes away the end-of-summer blues like a frozen fudge pop, and I hadn't had one in, like, forever. Plus, Mrs. Store Brand Scorecards wanted me to do this one for a while now, so I owed her. And here's another bonus -- frozen fudge pops are the perfect no-labor treat for Labor Day (and given the low calories and fat quota, pretty guilt-free. No need to regret sitting around eating treats on your day off). 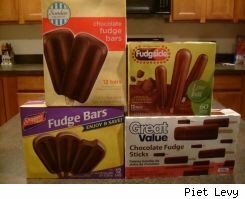 So Store Brand Scorecard sampled the classic Fudgsicle brand, as well as three store brand counterparts from a big box, grocery and mini market, respectively, to see which frozen fudge pop had the most pleasing taste for the price. All products were purchased Aug. 15 weekend in the Chicago area. Prices are subject to change. Cost: $3.99 for a box of 12 at a Chicago-area grocery store; $1 for a box of 8 at Walmart (12 pack not available at Walmart sampled). Size: 19.8 fluid oz. (12 1.65 fluid oz. bars) 20 cents per ounce at jewel . Size is 13.2 fluid oz. at Walmarrt for 8 cents per ounce. Taste: I haven't had a fudge pop in years, and noticing the low calorie count, I didn't expect all that much flavor. But this pop was a pleasant surprise, sweet and chocolatey. Taste: I thought Fudgsicle was pretty good. Then Great Value blew it out of the water. Bigger bars, bigger taste, and the calorie, fat, sodium and carbohydrate levels are on par (slightly higher in some cases, slightly lower in others). There is cholesterol though. Taste: How can such a decadent fudgey treat not have a single gram of fat in it? It's a miracle of food science. These bars are bigger than Fudgsicle and Great Value, and shockingly, the taste is even better. And while these bars may have more calories, sodium and total carbohydrate than Great Value, when you break it down per fluid ounce, its about the same. Taste: Each fudge pop was getting tastier and tastier, until Aldi was sampled. The bars may be as big as Jewel's but given the murky chocolate flavor, they're nowhere near as good. Greatest Value: With each bar being different in size (each Shoppers Value and Sundae Shoppe bar, for instance, is 1.5 ounces bigger than a Fudgsicle), Store Brand Scorecard calculated how much each brand cost per fluid ounce. It was the only way to really compare (fudge-covered) apples to apples. As a result, Fudgsicle was the most expensive, no surprise there, costing 20 cents per ounce at a grocery store and 13 cents an ounce at Walmart. And while not bad-tasting, they're not as good as others, (but still a good choice if you want a low fat snack). On a value score of 0 to 10, Fudgsicle gets a 5. The cheapest brand per ounce is Aldi's, again no surprise, but Sundae Shoppe isn't as strong as its store brand brothers when it comes to taste. Value score: 6. Second most expensive is Jewel's Shoppers Value, costing 13 cents an ounce. But these were the best tasting fudge bars, and you get big pops for the price. By comparison, Great Value costs 9 cents a bar, and are almost as good as Jewel. They're also on par with Fudgsicle as far as the nutritional facts go (except for that dash of cholesterol), making them a pretty guilt-free snack. But each bar is just slightly larger than a Fudgsicle. So after much deliberation -- and lots of delighted sampling -- Store Brand Scorecard declares Jewel-Osco's Shoppers Value to be the winner of this challenge. The pops are pricey, sure, but they're also the biggest and the best tasting, and when you factor in the cost per fluid ounce, they're really not all that much more expensive than Great Value. Walmart's Great Value gets a score of 7, Jewel-Osco's Shoppers Value a score of 8.